This month we are spotlighting one of our ryders who has been ryding with us since our very first week in 2013! Karen has been a consistent and powerful ryder for over 5 years. Throughout the years she has taken our cycle classes, hosted a Girls on the Run FUNdraising Ryde, done our OFF The Bike strength classes, and participated in our Power 30 clean eating program (and she looks GREAT!). While she often rydes solo, Karen can sometimes be found Power Ryding with her husband and/or one of her daughters! Regardless, she always comes with a smile on her face, ready to work! Do you remember your first ryde and how you felt after? I do remember my first ryde. I remember having to get the hang of coordinating my arms and legs when we were shaking the bikes, but I soon caught on. The key was just to be natural, instead of controlling my movements. I also remember being really sore the next day - arms AND legs, so I knew it was a good workout! You've been coming since our opening week in 2013, what has kept you coming back for more week after week and year after year? I love the Power Ryde workout. It’s a nice break from running. The classes give me a high intensity, cardio workout, while also working out my arms and core. It’s a great way to get a full body workout all in 45 minutes. You come to our OFF The Bike classes a lot. What do you like most about those? I love the Off the Bike classes because they target all the key muscle groups, all in 45 minutes. And I love that I’m able to get my workouts in, back to back. I find the classes challenging and I always feel sore (a good sore) the next day, so I know the workouts are making me stronger. I know you are a runner and have run several marathons and half marathons. How has Power Ryde helped your running? Overall Power Ryde has made me a stronger runner, by building up my legs and core. Not only did Power Ryde help me improve my marathon and half-marathon times, but I also felt less fatigued after my races. I think it’s because Power Ryde improved my overall physical condition. Now a days I look to Power Ryde to help balance out my workouts. Since I’m unable to handle the same amount of mileage these days, Power Ryde let’s me stay in good shape, while preserving my knees/hamstrings. 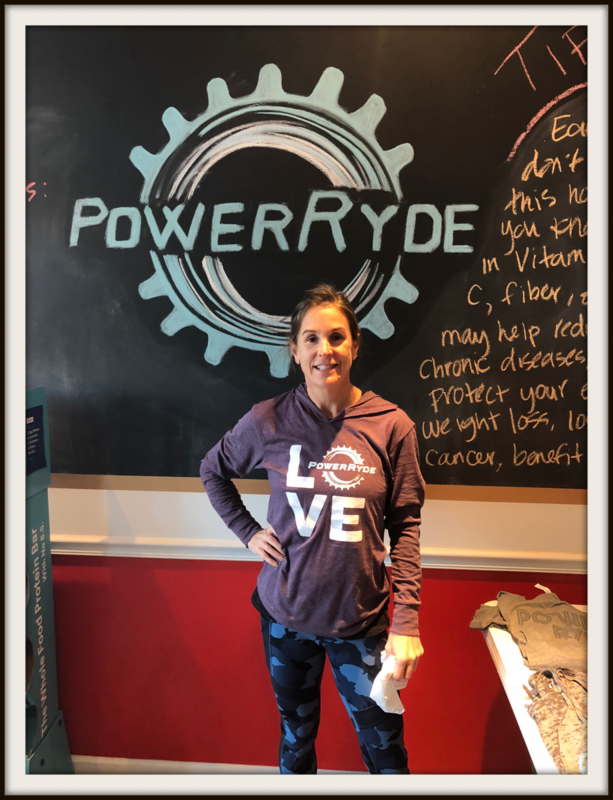 Power Ryde also introduced to me Whole 30 which has had a huge impact on my overall health and eating habits, and I’m feeling better in my 50's than I did in my 40's!! What goals are you hoping to achieve next year in 2019? For 2019 physical goals, I hope to continue my fitness regimen, squeeze in a few more “Off the Bike” classes, and compete in a couple half-marathons. All while remaining injury free! My favorite moment at Power Ryde is when we did the Girls on the Run fundraiser class. We raised over $1,000 for Girls on the Run Cincinnati, and it was a really fun way for Mothers and Daughters to interact with each other. What is your favorite music to ryde to? I love a variety of music at Power Ryde...from Amy’s classic rock to Casey’s disco beat! My fun fact is that I grew up in England. I spent my first 11 years in Allestree, Derby (northern England), and then moved to the USA with my family when I was 11 years old. I lost my British accent while I was in high-school, and naturalized to the USA while I was in college. After I married my husband Brian, we spent our first 2 1/2 years living in London, England, so it was neat for him to experience some of the British culture I grew up with, and he was able to meet my extended family, who all still live in England. I am a very goal oriented person. I love to set goals, and then work hard to achieve them, whether it’s physical exercise, school volunteer work or family activities. I love to busy and can’t sit still for long. When not Power Ryding, I’m running (outdoors), biking (outdoors) or spending time volunteering at my kids’ schools (Ursuline Academy and St. Columban). I was a Tri-Chair for the 2018 Ultimate Auction for Ursuline Academy, which was just held on November 17th. Planning this event has consumed me for the last year, so now I expect I’ll have some time on my hands before I pursue my next endeavor. This means you might just see me at a few more Power Ryde classes!! !